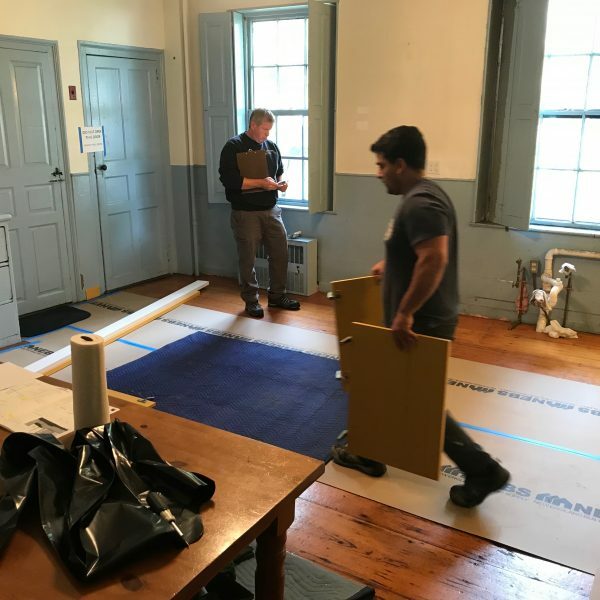 In 2017 we began planning the restoration of our historic kitchen. The re-installation of a soapstone sink removed a decade ago. The fabrication and installation of a new functional cabinet built in a historically sensitive style. A fresh coat of paint for the entire room. We used GoFundMe to accept donations for this important project. During our crowdfunding, Kevin Cradock of Kevin Cradock Builders happened upon the cocktail party we held to promote the project. He came inside, heard about what we were doing and generously offered to donate all materials, labor and project managment! Step inside our treasured kitchen by clicking the links below. 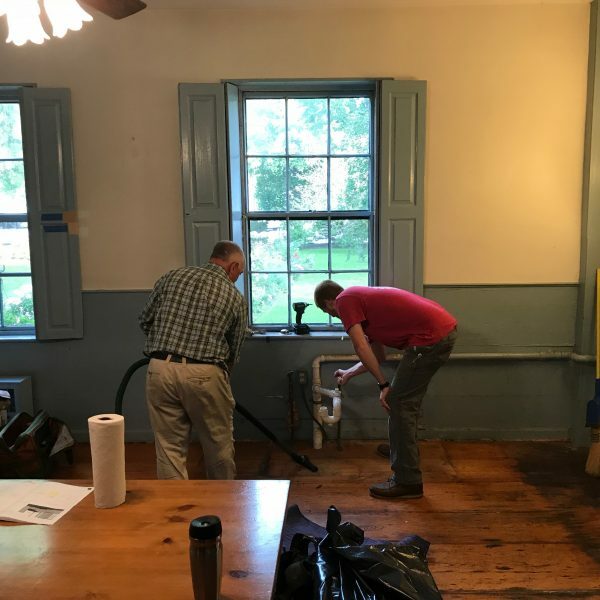 You will find articles written by some of our board members exploring some historic details of the kitchen. Click Here to learn about the Historic Servants Bells. Click Here to learn about the Wooden Shutters. Click Here to learn about the coal-burning stove. Click Here to learn about the Beehive Oven. 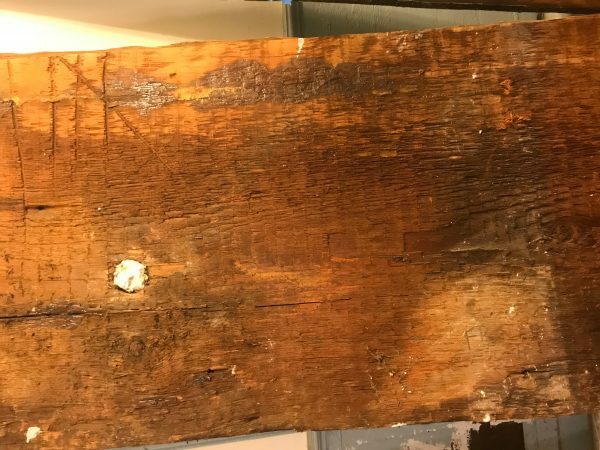 Board member Jonathan Brush snapped this photo of an plank of wood original to the house. The carpenter said it was sawn and planed in a water powered sawmill in 1700s! 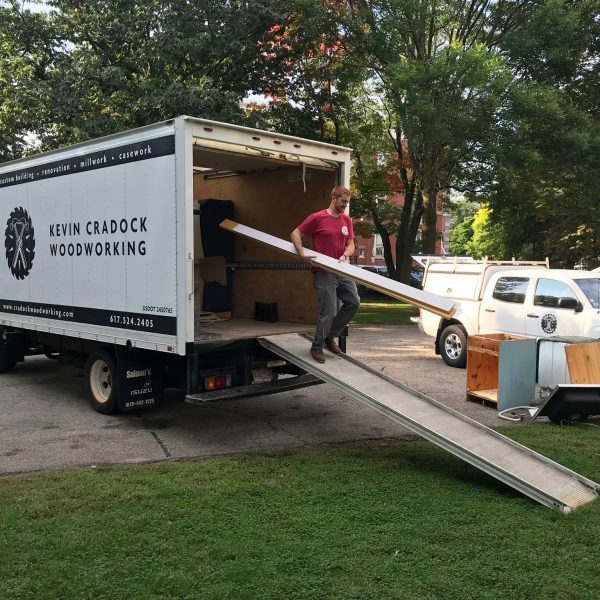 On October 1st, The Kevin Cradock Builders team arrived to dismantle the current cabinets and move in our new custom cabinet pieces. Work is expected to take place throughout next week as well. 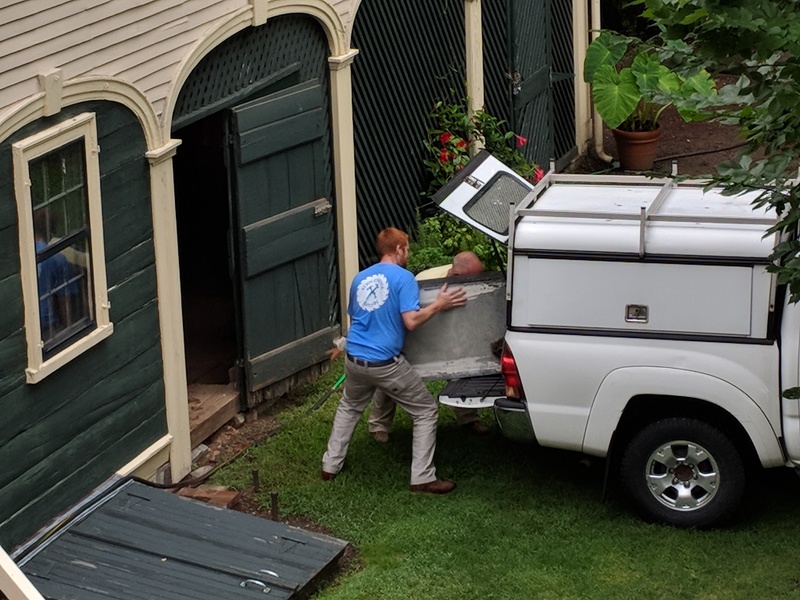 Members of the Kevin Cradock team have retrieved the soap stone sink from our barn and brought it to the Cradock workshop to prepare it for re-installation! 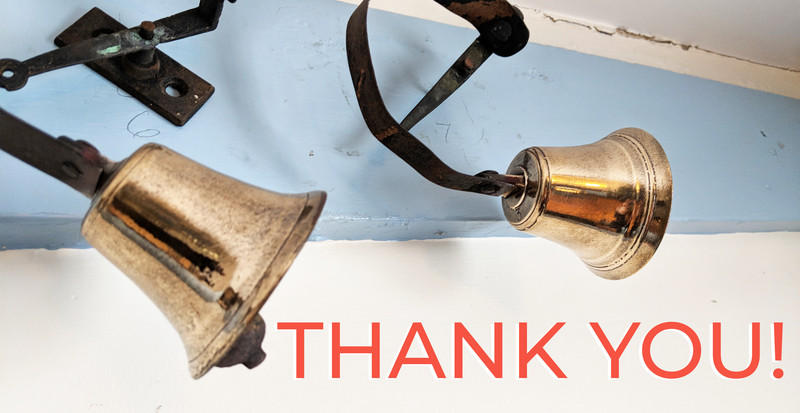 Our Restore the Heart of the House GoFundMe campaign is officially closed and we have successfully raised enough funds from our campaign – in addition to the generous donation of time, skill, and materials from Kevin Cradock Builders – to complete this important restoration project! June 1st, 2017 – The Loring Greenough House was constructed in 1760 by Commodore Loring and owned by the Greenough family from 1783 until 1924. The Jamaica Plain Tuesday Club purchased the house in 1924 and has been steward ever since then. In 2008, the club articulated a vibrant new community-oriented role for the House as a center for social, cultural, historical, and educational activities. 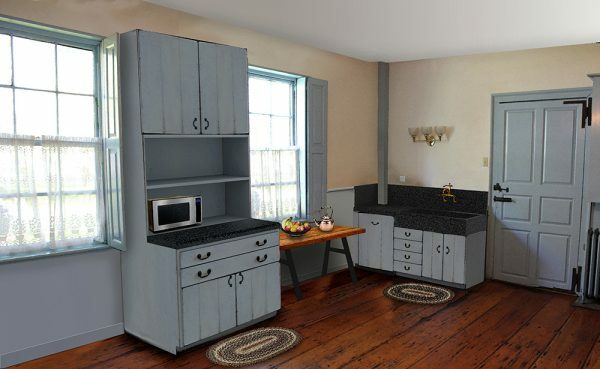 In early 2018 we are planning a renovation of our historic kitchen – installing new cabinetry and returning a soap stone sink to its rightful place. 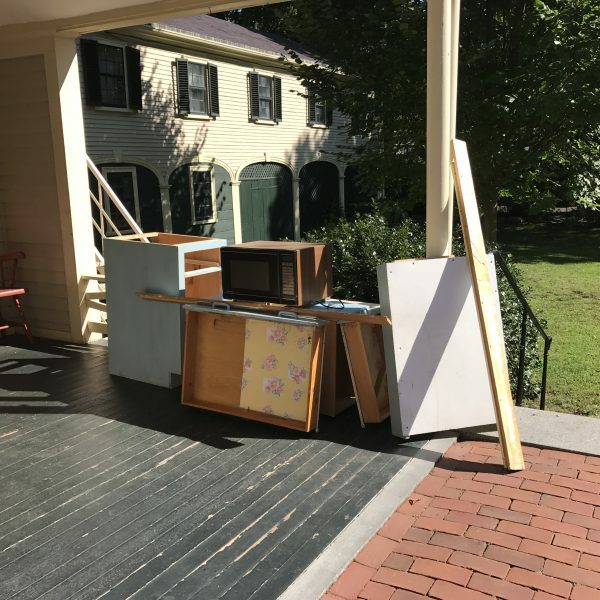 Please help us restore the heart of the house to its former glory. The kitchen is not only a popular stop on docent-led tours but it is also a vital place for private events, weddings, meetings and retreats which generate income used to preserve and maintain the house.